The United Sates Embassy in Addis Ababa, Ethiopia announces its plan to launch a media fund to support independent, credible and responsible media that supports the democratization process of the country. “We’re launching a fund to support the sustainability and professionalism of new independent media houses,” said Ambassador Michael Raynor, speaking at a round table discussion the VOA held at the Embassy last week with invited journalists. Mentioning Fulbright Scholars and Specialists, and Ambassador’s Distinguished Scholars, to work with journalists and journalism students as some of the supports of U.S. government to improve journalism in Ethiopia, Ambassador Raynor said: “This week, we began another training program, in partnership with the British Embassy that will increase transparency and the flow of information between journalists and government officials”. He also noted that the Embassy so far has trained over 260 journalists, in every region of Ethiopia, on investigative reporting focused on exploring the impact that development projects have on the country. “Such programs are intended to invest in you, Ethiopia’s professional journalists, and the important work that you do. Back in August, we held our annual dialogue with the Ethiopian government on democracy, human rights, and governance here in Addis. One of the key outcomes of this dialogue was an agreement to explore ways the United States can help support professional journalism in Ethiopia,” Ambassador Raynor said. 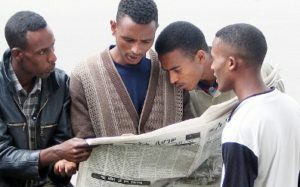 As Ethiopia pursues its unprecedented democratic and economic reforms, thoughtful, impactful, and high-quality journalism is more important than ever before, according to Ambassador Raynor. “Ethiopia needs you because having access to credible and unbiased information, and being able to use that information to make wise decisions, is a fundamental requirement of any democracy. Democracies simply don’t survive if information flows only from the government to the governed; rather, democracies must sustain, and benefit from, conversations in all directions. And the better-informed those conversation are, the stronger the democracy,” he said. Ambassador Raynor further stated that as Ethiopia’s reform efforts continue, both the government and the people will need credible and responsible media outlets. “Journalism must ensure that people are informed about what the government, opposition groups, and civil society are saying and doing. No less important, journalism must also scrutinize these actors and their actions, provide context, research the facts, and present a range of views to help people understand the options before them and reach well-informed conclusions,” he said. He stated that journalism best meets these needs when it objectively reflects a range of views, provides a platform for discussion that is open to all voices, welcomes constructive dissent, and is as inclusive as possible. He further mentioned the need for the media to trade in facts by avoiding speculation and bias as well as the importance of creating space for diverse views. “While featuring diverse voices is important, journalists need to track down the facts and help the Ethiopian people sort through the tremendous volume of information, and mis-information, that inundates us all in these complicated times,” Ambassador Raynor said.